I was born in New Hampshire in 1985. At the age of 16 I attended Bard College at Simon's Rock and received an A.A. in liberal arts. After I graduated I spent a year volunteering across America with the National Civilian Community Corps (NCCC) an AmeriCorps program. When I returned home I got my Bachelor's degree in political science from Florida State University (FSU). I traveled to Indonesia on a Fulbright scholarship to teach English and American cultural studies to Muslim students. My experiences in public service, travel and teamwork are a huge influence on my writing. 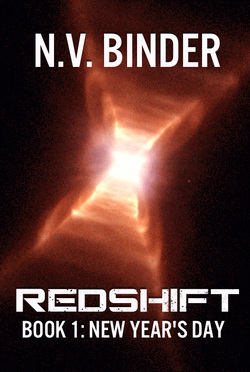 New Year's Day is the first book in the Redshift series, which follows twenty-first century engineer J.D. Mitchell when he is suddenly transported into the distant future. When we first meet Mitchell, he's been captured as a pirate, eighteen months after arriving in the future. The story unfolds in flashback as Mitchell describes his experiences, his friends, and his first crimes. His confession is backed up by information from "the watson," an implant that recorded everything he's seen and done since then. Mitchell must tell the absolute truth, exposing his friends to the same fate he faces in the hands of the Regular Army. Meanwhile, as his interrogation unfolds, Mitchell's first adventure on a derelict spaceship takes off. Suddenly woken from stasis, Mitchell doesn't even have time to get his bearings before he's caught up in a daring prison escape, along with Lauren Tybee, the Regular Army officer who woke him. When the ship is hailed, Mitchell and Lauren must choose who to trust, when to run and where to draw the line.